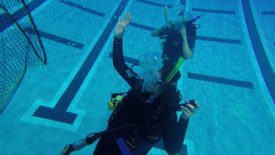 Share the post "Department of Marine and Coastal Sciences and Rutgers Recreation Team up to Provide Undergrads with Scientific Diving Instruction"
Rutgers’ scientific diving course is one of the few such classes open to undergraduates in the United States. Photo: Cameron Bowman/Rutgers University. Scientific diving is essential to Rutgers’ – and its students’ – worldwide leadership in oceanography. This class is helping to open doors for our undergraduates. Breathing through their Scuba gear, Ailey Sheehan and her classmates dropped a new and improved lionfish trap – a hinged net that will help scientists study that invasive fish in the Caribbean – into the dive pool at Rutgers. Sheehan, a junior marine science major, discovered the opportunity to help design, build and conduct underwater testing of the fish-snaring device through Rutgers-New Brunswick’s scientific diving class, created though collaboration between the Department of Marine and Coastal Sciences and Rutgers Recreation. 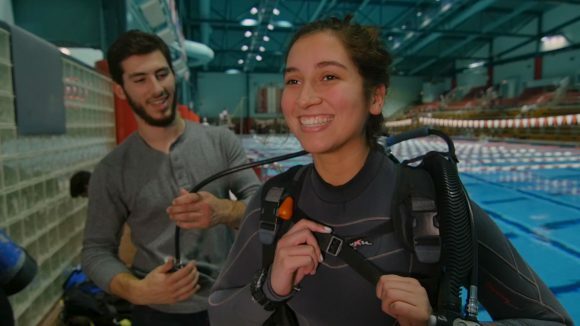 Led by the Rutgers Recreation’s scuba coordinator Debbie Miller, a veteran diver, scientific diving is one of the few such classes open to undergraduates in the United States. The class leads to certification as a recreational diver, a rescue diver, and – by the American Academy of Underwater Sciences – a scientific diver. “Scientific diving is essential to oceanographic research, an area in which Rutgers is a worldwide leader,” Miller said. The students in her class learn advanced open water and rescue diver skills, as well as the use of scientific methods underwater. That they can acquire these skills and attain this certification while still undergraduates opens more doors, and opens them sooner, than would be the case if they had to wait until they entered graduate school as in other institutions. “You can apply for graduate programs. You can apply to do research. 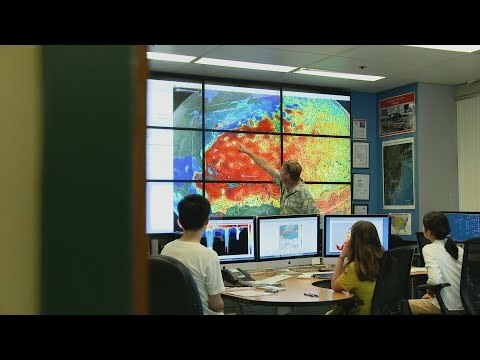 You can be a citizen scientist. The course sets all the groundwork, so if you want to go into professional diving or be a dive master, you can do that as well,” Miller said. Click to watch Scientific Diving Program Video. Rutgers sends its faculty and student scientific divers around the world. For example, they help deploy, recover and repair the submersible robot gliders whose use the university has pioneered as ocean-observing instruments. Right now in the Philippines, a team led by environmental sciences professor Malin Pinsky is using scientific diving to research how anemone fish – better known as clownfish – disperse their larvae in coral reefs.